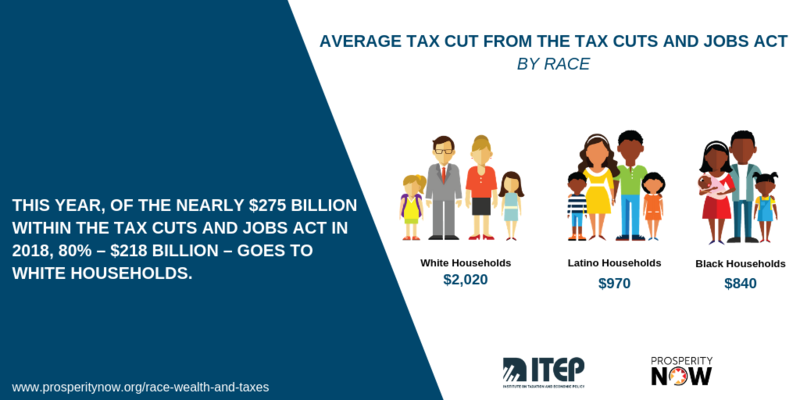 Last year, Congress had a tremendous opportunity with the Tax Cuts and Jobs Act (TCJA) to help low-income and middle-class families—particularly those of color—build the wealth needed to secure their share of the American Dream. Unfortunately, by spending the majority of the $1.9 trillion within this law to provide large tax breaks for the wealthy and multi-billion-dollar corporations, Congress chose to actively invest in policies that exacerbate economic inequality rather than mitigate it. Even worse, in designing and enacting the 2017 tax law, Congress not only choose to grow the economic gap between rich and everyone else, but also between White households and households of color, thus further perpetuating a long history of systemic racism that undergirds government policies and American society at large. 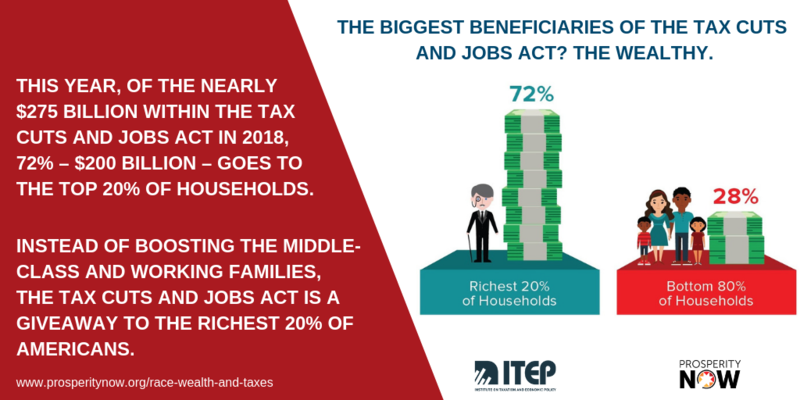 Using ITEP’s microsimulation model, which generates tax estimates for a sample of representative taxpayer records, this study provides the first quantitative analysis to examine the racial implications of the TCJA, and how these tax cuts reward existing White wealth at the expense of the economic security of households of color, poor households, and a stalling middle class. Of $275 billion directed in TCJA tax cuts in 2018, $200 billion (72%) goes to the top 20% of households. Instead of boosting the middle class and working Americans, this is a giveaway to the richest 20% of Americans. Because America’s wealthiest families are overwhelmingly White, it is inevitable that a tax cut geared to the very top would shower out-sized benefits on White households relative to the overall population and households of color. For instance, while 1.2% of White families earn enough to place them among the top 1% percent of earners, just 0.4% of Latino and Black families are members of this group. Put another way, White families are three times more likely than Latino and Black families to be among the nation’s top earners. As a result, households of color are largely excluded from accessing the Tax Cuts and Jobs Act’s benefits, leaving them with little support from one of our nation’s largest systems for improving the economic outcomes of American households. Of the $275 billion in tax cuts the TCJA provides to individuals this year, $218 billion (80%) goes to White households. On average, White households will receive $2,020 in cuts, while Latino households will receive $970 and Black households receive $840. More than 40% of all tax cuts from the Tax Cuts and Jobs Act go to the White households in the top 5% of earners, despite only representing 3.9% of all tax returns.